Citation: Chandrasekar R, Debnath S, Sivagami B, et al. Therapeutic Efficacy of Flavonoids and Terpenoids an ongoing Herbal Therapy in the Treatment of Leishmaniasis. Nat Prod Ind J. 2018;14(2):124. Leishmaniasis is an epidemic disease caused by Leishmania parasite. Leishmaniasis is a major disease worldwide many people are affected by this disease. The prevalence of the disease is seen in many countries around the world since many millions are affected by the disease in different countries and thousands of deaths occur every year this is a neglected tropical disease. There are more than 20 species in the world. The parasite develops its life cycle in sand flies. The disease is transmitted by the phlebotomine sand fly which lives in rodents, dogs etc. This parasite uses animals like dogs as a host and develops its life cycle and this disease is carried over to humans through a bite of the insect. This disease is caused due to poor sanitary conditions. The treatments with synthetic drugs have severe side effects and the treatment is very expensive. A major development is seen in developing countries like India in finding new herbal entities to eradicate the disease through herbal remedies. An attempt has been made to review flavonoids and terpenoids their biological role in the treatment of leishmaniasis, these are major secondary metabolite used in the treatment of leishmaniasis by producing therapeutic efficacy against many diseases like visceral leishmaniasis. They are equally potent to marketed antileishmanial drug. This review gives the significance of flavonoids and terpenoids as potent compounds with biological activity present naturally in many plants, fruits, vegetables, as coloured pigments, etc. these compounds can be isolated their therapeutic efficacy can be tested and they can develop promising activities against many diseases. Leishmaniasis called as Kala-Azar in India is a vector borne disease transmitted by sand flies. Leishmaniasis is a parasitic disease caused by more than 20 Leishmania protozoan parasite species. Almost 2.5 million people are affected all over the world, 1-1.5 million are affected by cutaneous Leishmaniasis and in India over 90000 are affected by visceral Leishmaniasis VL. From 2004-2008 there were an estimated 200,000-400,000 cases and 20,000-40,000 deaths per year globally . WHO is taking preventive measures to eradicate the vector and the disease within 2020 . This parasite starts its life cycle in sand fly (Figure 1). An epidemic disease caused by leishmania parasite and can be transmitted from a bite of an infected sand fly. It affects either the skin or the internal organs. These parasites are transmitted to humans by the bites of the infected female phlebotomine sandfly. There are three different types of leishmaniasis cutaneous, visceral and mucocutaneous. VL is a serious disorder were internal organs like liver, spleen and lymph node gets affected. The symptoms include fever, enlargement of the liver and spleen, anaemia, weight loss, weakness, decreased production of blood cells, bleeding and swollen lymph nodes. Treatments are given using antimony compound sodium stibogluconate and amphotericin B that causes severe side effects than any other treatment option, but which is very expensive. But the diagnosis and treatment given to patients should be in an affordable price. Both treatments have side effects such as fever, liver and kidney damage or heart disease. A new molecule miltefosine, is available can be given orally and has a lower risk of toxicity. The research on herbal remedies should be given more significance to eradicate the disease and the side effects, so researchers should concentrate more on herbal therapies. The aim of this review was to provide an overview of the ethanobotany of medicinal plants used to treat leishmaniasis in India. This review was to analyze the presentation of herbal therapies for the treatment of leishmaniasis, on the basis of diagnosis, treatment, management and follow up with the objective of highlighting visceral leishmaniasis as an important differential diagnostic tool for the eradication of VL [3,4]. 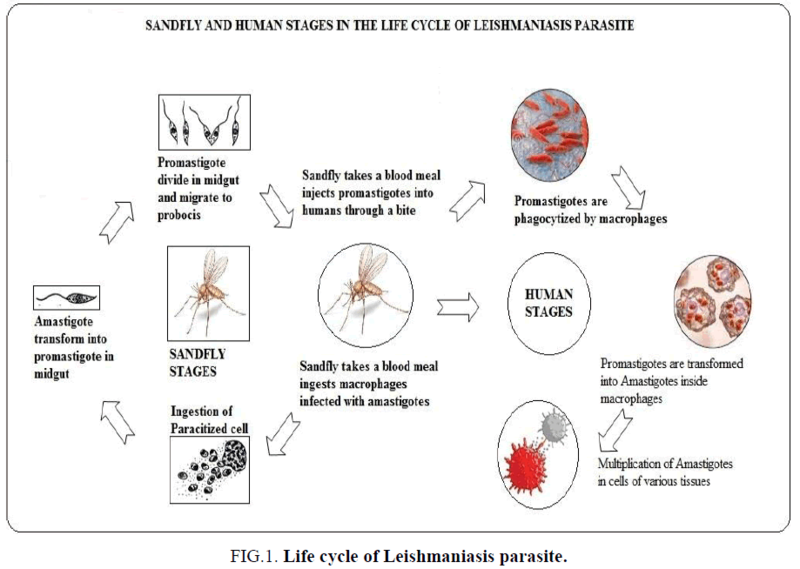 Figure 1: Life cycle of Leishmaniasis parasite. Since time immemorial India is considered to be the land of herbal garden, and the ancient practice in treatment using traditional system of medicine, complementary alternative medicine, like ayurveda, siddha, unani and homeopathy. These Indian systems of medicine have played a vital role in treatment of various diseases including, cancer, Alzheimer’s disease, parasitic diseases like, filariasis and leishmaniasis. India is a home for herbal medicine many medicinal plants were used in the form of monoherbal and polyherbal formulation in single and combined dosage forms. In India many herbs are used for leismaniasis, people prefer herbal medicine for treatment since minor or no side effects can be observed and allopathic medicine is the major treatment given but with severe side effects. Varity of medicinal plants have been used by Indian people of different cultures to treat leishmaniasis. Most of the plants were herbs and the commonly used plant part was leaf. Majority of prepared remedies were applied externally to the affected part. There is an urgent need to conduct clinical trials on such plants to support traditional claims and to analyze molecular and cellular mechanisms involved. The epidemiology of Leishmaniasis is found in 88 countries, of which 72 countries are developing countries and 13 are under developed countries. Cutaneous leishmaniasis is found in the Middle East, Asia and Africa. Visceral leishmaniasis is found in Africa and Asian countries. Also this disease is more in Arabian countries in Iran, Afghanistan saudiarabia and Syria. In India it is mainly found in west Bengal, Bihar and Uttar Pradesh. VL called as Kala-azar is a serious disorder more Indians and African countries like Sudan, Somalia etc. are affected by VL. Hence this is an endemic disease found only in western part of the country. The environmental and climatic condition is suitable for the insect vector to grow. It is also found in epidemic and non-endemic areas of the country (Figure 2). 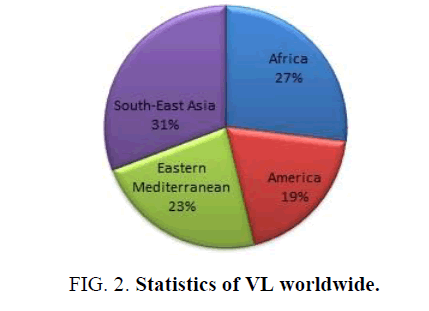 Figure 2: Statistics of VL worldwide. Flavonoids and terpenoids are natural occurring secondary metabolites present in plants. 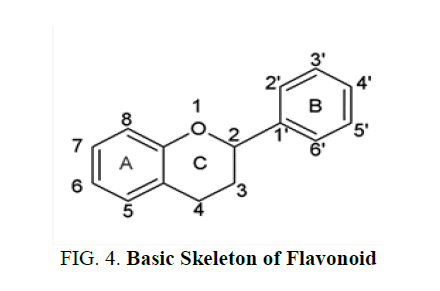 Flavonoids are having a polyphenolic structure. They are abundant in plants their biological activity is vast they have high therapeutic value against many diseases which include cardiovascular diseases, anti-cancer, neurological disorders, skin diseases and various other acute and chronic diseases. Flavonoids are therapeutically active and they have antioxidants, free radical scavenging activity. These compounds possess active phytoconstituents, they are potent active constituents found in many plants, fruits and vegetables. They are more efficacious against many diseases and they are potent active constituents present in many plants. They have less side effects and low toxicity. To overcome these side effects and toxicity these natural compounds are used. The isolation of these compounds leads to promising pharmacological activities. Flavonoids are classified into many classes like flavones, flavonols, flavonones, anthocyanins, isoflavonoids, chalcones etc. each classes of flavonoids are subdivided into many subclasses. They also contain phenolic acids like hydroxyl cinnamic acid present in caffeic acid, ferulic acid and gingerol and hydroxyl benzoic acid present in ellagic acid and gallic acid. They contain hydrosable tannins such as chebulic acid and gallo tannins (Figures 3 and 4). Flavonoid contain C6-C3-C6 compounds, each C6 moiety is a benzene ring. They contain one or more phenolic hydroxyl groups combined with sugar moiety. The hydroxyl groups are found in 5 and 7 position in ring A, ring B contains hydroxyl alkoxyl groups. The aromatic ring A is condensed to heterocyclic ring C attached to a second aromatic ring B. It contains a flavonoid diphenyl propane skeleton. They are divided into two sub classes which include anthocyanins and anthoxanthins. Anthocyanins are water soluble plant pigments containing glycosides. Anthoxanthins are yellow or colorless compounds containing flavones, flavonols, isoflavones and flavonones . • Galangin  is a flavonol type of flavonoid which is found in the rhizome of Alpinia galanga. Figure 5: Chemistry of Flavonoids. Plant terpenoids are used for their aromatic qualities and play a significant role in traditional herbal remedies. The terpenoids are called isoprenoids, are a large and diverse class of naturally occurring organic chemicals derived from terpenes. Most are multicyclic structures with oxygen-containing functional groups. About 60% of known natural products are terpenoids . Although sometimes used interchangeably with "terpenes" terpenoids contain additional functional groups, usually O-containing . Terpenes are hydrocarbons. Terpenoids at least those containing an alcohol functional group often arise by hydrolysis of carbocationic intermediates produced from geranyl pyrophosphate. Analogously hydrolysis of intermediates from farnesyl pyrophosphate gives sesquiterpenoids, and hydrolysis of intermediates from geranylgeranyl pyrophosphate gives diterpenoids etc. 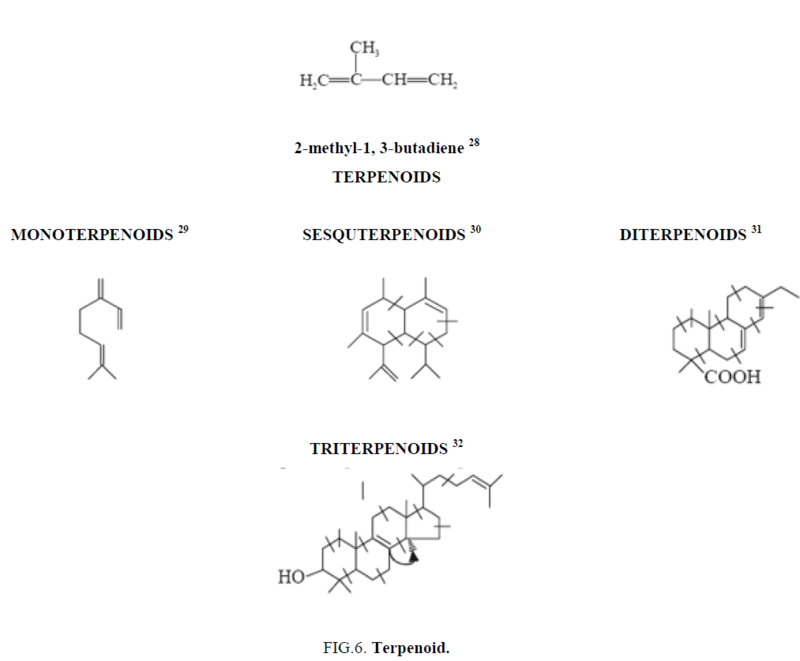 Terpenoids are natural products whose structures are considered to be divided into several isoperene units therefore, these compounds are termed as isoprenoids. This particular group of compounds is referred as terpenes. The isoprene units come through the biogenetic means starting from acetate mevalonic acid. Each unit consists of five-carbon having two unsaturated bonds and possesses a branched chain. The terpenoids have a number of isoprene units joined together in a head to tail manner. Isoprene rule: The basic concept that terpeniods are essentially built up of several isoprene units is commonly termed as the isoprene rule. Medicinal Plants Used in the Treatment of Leishmaniasis (Table 1). Table 1. The table specifies the plant name, the vectors, different extracts, the isolated compounds and their activity. The different dosage forms and formulations available in the form of nanoparticles, liposomes, neosomes etc. are reported in this study (Table 2). Table 2. Formulations containing nanoparticles. In recent years many pharmacologically active compounds isolated from natural sources have shown promising activities. Many compounds isolated from plants such as chalcones, alkaloids, lignans, sesquiterpenes, triterpenes, saponins, phenols, sterols, coumarins and tannins have shown activity against leishmaniasis (Table 3). Proanthocyanidins Khaya senegalensis Leishmania donovani, L.
Table 3. Plants containing flavonoids and terpenoids. Visceral Leishmaniasis Kala-Azar a killer in the country is a dreadful disease affecting many millions in the world. According to the World health organization the current prespective is that the disease should be eradicated within 2020. WHO is taking preventive measures to eradicate the disease and the parasite vector in spraying of pesticides, protection and prevention against the insect vectors. Since the symptom of the disease are severe with skin lesions which do not disappear for long time in cutaneous leishmaniasis, visceral leishmaniasis where liver and spleen gets damaged and leads to death and mucocutaneous leishmaniasis leads to loss of oral cavity and nasal tract. These symptoms are severe and the diagnosis and treatment given to this disease is too costly. There are many synthetic drugs available with severe side effects. These side effects are toxic to cells and tissues. These drugs may be potent and efficacious but side effects are more. The cost of these drugs is comparatively high but the treatment given to poor patients must be economic and affordable price. Hence there is a growing demand for herbal medicine and most of the growing population depends on herbal medicine for treatment. India is a hidden treasure of medicinal herbs, these traditional and complementary alternative medicine should be given prime importance in exploring new plants, extraction of phytoconstituents from them, scientist and researchers must come forward isolate phytoconstituents develop them into new lead compounds and formulations to treat various diseases. Even the cultivation of these medicinal plants must be given prime importance. The duration of treatment in alternative system of medicine through ayurveda, siddha, unani and homeopathy may be longer but with no or less side effects and low toxicity to cells and tissue, no damage to internal organs are the advantages of herbal medicine. The drug prepared may be a drug of choice for the poor patients with safety and efficacy and economic and reach patients in an affordable price to treat visceral leismaniasis. Alvar J, Vélez ID, Bern C, et al. Leishmaniasis worldwide and global estimates of its incidence. PLoS One. 2012;7(5):e35671. Global Health Observatory. Leishmaniases, 2018. Chemistry, International Union of Pure and Applied. IUPAC Compendium of Chemical Terminology, IUPAC, 2014. Nigussie D, Tasew G, Makonnen E, et al. In-vitro investigation of fractionated extracts of Albizia gummifera seed against Leishmania donovani amastigote stage. J Clin Cell Immunol. 2015;6:373. Panezai MA, Achakzai JK, Kakar AM, et al. GC-MS analysis and in vitro antileishmanial activity of ethylacetate fraction of Allium cepa (EAFAC). Int J Pharm Sci and Res. 2018;9(4):1600-8. Krstin S, Sobeh M, Braun MS, et al. Anti-parasitic activities of Allium sativum and Allium cepa against Trypanosoma b. brucei and Leishmania tarentolae. Medicines (Basel). 2018;5(2):e37. Sadeghi-Nejad B, Saki J. Effect of aqueous Allium cepa and Ixora brachiata root extract on Leishmania major promastigotes Jundishapur. J Nat Pharm Prod. 2014;9(2):e15442. Sachdeva H, Sehgal R, Kaur S. Asparagus racemosus ameliorates cisplatin induced toxicities and augments its antileishmanial activity by immunomodulation in vivo. Parasitol Int. 2014;63(1):21-30. Vila-Nova NS, Morais SMd, Falcão MJC, et al. Leishmanicidal activity and cytotoxicity of compounds from two annonacea species cultivated in Northeastern Brazil. Rev Soc Bras Med Trop. 2011;44(5):567-71. Mesa LE, Vasquez D, Lutgen P, et al. In vitro and in vivo antileishmanial activity of Artemisia annua L. leaf powder and its potential usefulness in the treatment of uncomplicated cutaneous leishmaniasis in humans. Rev Soc Bras Med Trop. 2017;50(1):52-60. Aloui Z, Messaoud C, Haoues M, et al. Asteraceae Artemisia campestris and Artemisia herba-alba essential oils trigger apoptosis and cell cycle arrest in Leishmania infantum Promastigotes. Evidence-Based Complementary and Alt. Med. 2016;1-15. Sen R, Saha P, Sarkar A, et al. Iron enhances generation of free radicals by Artemisinin causing a caspase-independent, apoptotic death in Leishmania donovani promastigotes. Free Radic Res. 2010;44(11):1289-95. Kumar S, Bhaumik J, Paul J, et al. Asiaticoside induces tumour-necrosis-factor-a-mediated nitric oxide production to cure experimental visceral leishmaniasis caused by antimony-susceptible and resistant Leishmania donovani strains. Antimicrob Chemother. 2012;67:910-20. Carneiro SM, Carvalho FA, Santana LC, et al. The cytotoxic and anti-leishmanial activity of extracts and fractions of leaves and fruits of Azadirachta indica (A Juss.). Biol Res. 2012;45(2):111-6. Chouhan G, Islamuddin M, Want MY, et al. Apoptosis mediated leishmanicidal activity of Azadirachta indica bioactive fractions is accompanied by Th1 immunostimulatory potential and therapeutic cure in vivo.Parasit and Vectors. 2015;8:183. Erharuyi O, Adhikari A, Falodun A, et al. Cytotoxic, Anti-inflammatory and leishmanicidal activities of diterpenes isolated from the roots of Caesalpinia pulcherrima. Planta Med. 2017;83:104-10. Jaffary F, Nilforoushzadeh MA, Moradi S, et al. Concentrated extracts of cassia fistula versus intralesional injection of meglumine antimoniate in treatment of acute cutaneous leishmaniasis. J Skin Stem Cell. 2014;1(1):e16631. Patrícia Sartorelli Samanta P, Andrade Márcia SC, Melhem Frederico O, et al. Tempone isolation of antileishmanial sterol from the fruits of Cassia fistula using bioguided fractionation. Phytotherapy Res. 2007;21(7):644-7. Zare H. The effect of Citrullus colocynthis extracton cutaneous leishmaniasis lesion in human. Biomed Pharmacol J. 2010;3(1):11-13. Das P, Paik D, Parmanik A, et al. Antiproteolytic and leishmanicidal activity of coccinia grandis (L) leaf extract against Leishmania donovani promastigotes. Ind J Exp Biol. 2015;53:740-6. Lahiry S, Das AK, Das SN, et al. Ethanolic leaf extract of Coccinia grandis is effective against both drug resistant and drug sensitive clinical isolates of Indian Kala-azar. J Parasit Dis. 2018;42(3):433-41. Rondon FCM, Bevilaqua CML, Accioly MP, et al. In vitro efficacy of Coriandrum sativum, Lippia sidoides and Copaifera reticulata against Leishmania chagasi. Rev Bras Parasitol Vet. 2012;21(3):185-91. Almeidaa BC, Araujo BQ, Carvalho AA, et al. Antiprotozoal activity of extracts and isolated triterpenoids of ‘carnauba’ (Copernicia prunifera) wax from Brazil. Pharma Bio. 2016;54(12):3280-84. Zhang J, Rahman AA, Jain S, et al. Antimicrobial and antiparasitic abietane diterpenoids from Cupressus sempervirens. Res Rep Med Chem. 2012;2:1-6. Amaral ACF, Gomes LA, Silva JRdeA., et al. Liposomal formulation of turmerone-rich hexane fractions from Curcuma longa enhances their antileishmanial activity. BioMed Res Int. 2014;1-8. Saleheen D, Ali SA, Ashfaq K, et al. Latent activity of curcumin against leishmaniasis In vitro.Biol Pharm Bull.2002;25(3):386-89. Khanna VG, Kannabiran K, Getti G. Leishmanicidal activity of saponin isolated from the leaves of Eclipta prostate and Gymnema sylvestre. Ind J Pharmacol. 2009;41(1):32-5. Kaur S, Kaur G, Sachdeva H, et al. In vivo evaluation of the antileishmanial activity of two immunomodulatory plants, Emblica Officinalis and Azadirachta Indica In Balb/C Mice. Int J Ayur Herb Med. 2013;3(1):1066-79. Oskuee RK, Jaafari MR, Moghaddasi M, et al. Evaluation of leishmanicidal effect of Euphorbia petiolata extract by in vivo anti-leishmanial assay using promastigotes of Leishmania major Avicenna. J Phytomed. 2018;8(6):524-36. Serakta M, Djerrou Z, Mansour-Djaalab H, et al. Antileishmanial activity of some plants growing in Algeria: Juglans Regia, Lawsonia Inermis and Salvia Officinalis. Afr J Tradit Complement Altern Med. 2013;10(3):427-30. Iqbal K, Iqbal J, Staerk D, et al. Characterization of antileishmanial compounds from lawsonia inermis l. leaves using semi-high resolution antileishmanial profiling combined with HPLC-HRMS-SPE-NMR. Front Pharmacol. 2017;8:337. Al-Ogaili N. Synergistic effect of Lawsonia inermis and Peganum harmala aqueous extracts on in vitro growth of Leishmania tropica promastigotes comparison to sodium stibogluconate. AL-QMJ. 2016;12(22):76-83. Rahimi-Moghaddam P, Ebrahimi SA, Ourmazdi H, et al. In vitro and in vivo activities of Peganum harmala extract against Leishmania major. J Res Med Sci. 2011;16(8):1032-9. Mirzaie M, Nosratabadi SJ, Derakhshanfar A, et al. Antileishmanial activity of Peganum harmala extract on the in vitro growth of Leishmania major promastigotes in comparison to a trivalent antimony drug. Vet arhiv. 2007;77(4):365-75. Haldar N, Basu S, Bhattacharya S, et al. Antileishmanial activity of Mangifera indica leaf extracts on the in vitro growth of Leishmania donovani promastigotes. Elixir Pharmacy.2012;46:8189-91. Ramos EH, Moraes MM, Nerys LL, et al. Chemical composition, leishmanicidal and cytotoxic activities of the essential oils from Mangifera indica L. var. Rosa and Espada. BioMed Res Int. 2014;1-9. Khan I, Yasinzai MM, Mehmood Z, et al. Comparative study of green fruit extract of Melia azedarach Linn. with its ripe fruit extract for antileishmanial, larvicidal, antioxidant and cytotoxic activity. Am J Phytomed Clin Ther. 2014;2(3):442-54. Khan I, Umar MN. Evaluation of crude extract of Melia azedarach Linn. against attenuated amphotericin B resistant Leishmania tropica strain. J Bas App Sci. 2015;11:314-17. Kaur A, Kaur PK, Singh S, et al. Antileishmanial compounds from Moringa oleifera Lam. Z. naturforsch. 2014;69:110-6. El-khadragy M, M Alolayan E, M Metwally D, et al. Clinical efficacy associated with enhanced antioxidant enzyme activities of silver nanoparticles biosynthesized using Moringa oleifera leaf extract, against cutaneous leishmaniasis in a murine model of leishmania major. Int J Environ Res Public Health. 2018;15:1037. Singh MK, Paul J, De T, et al. Bioactive guided fractionation of Moringa oleifera lam. flower targeting L. donovani. Ind J Exp Bio. 2015;5:747-52. Gupta S, Raychaudhuri B, Banerjee S, et al. Momordicatin purified from fruits of Momordica charantia is effective to act as a potent antileishmania agent. Parasitol Int. 2010;59(2):192-7. Noormohammadi H, Maroufi Y, Dabirzadeh M, et al. Anti-leishmanial activity of methanolic extract of Nerium oleander L. against leishmania major. Med Lab J. 2017;11(6):30-4. Dayakar A, Chandrasekaran S, Veronica J, et al. In vitro and in vivo evaluation of anti-leishmanial and immunomodulatory activity of neem leaf extract in Leishmania donovani infection. Exp Parasitol. 2015;153:45-54. Onocha PA, Ali MS. Antileishmaniasis, phytotoxicity and cytotoxicity of Nigerian Euphorbiaceous Plants 2: Phyllanthus amarus and Phyllanthus muellerianus Extracts.African Scientist. 2010;11(2):1595-6881. Chowdhury S, Mukherjee T, Mukhopadhyay R, et al. The lignan niranthin poisons Leishmania donovani topoisomerase IB and favours a Th1 immune response in mice. EMBO Mol Med. 2012;4:1126-43. Sood A, Kaur R, Kaur J, et al. In vitro and In vivo Evaluation of Antileishmanial Activity of Phyllanthus niruri (Family: Euphorbiaceae). Int J trop disease Health. 2016;13(1):1-15. Sarkar A, Sen R, Saha P, et al. An ethanolic extract of leaves of Piper betle (Paan) Linn mediates its antileishmanial activity via apoptosis. Parasitology Res. 2008;102(6):1249-55. Misra P, Kumar A, Khare P, et al. Pro-apoptotic effect of the landrace Bangla Mahoba of Piper betle on Leishmania donovani may be due to the high content of Eugenol. J Med Microbiol. 2009;58:1058-66. Mishra BB, Gour JK, Kishore N, et al. An antileishmanial prenyloxy-naphthoquinone from roots of Plumbago zeylanica, Nat Pro Res. 2013;27(4):5480-5. Sarkar J, Pal S, Bhattacharya S, et al. In vitro antileishmanial activity of Pleumeria pudica leaf extracts on Leishmania donovani promastigotes. American-Eurasian J Sci Res. 2013;8(2):68-71.
de Souzaa CES, da Silva ARP, Gomez MCV, et al. Anti-Trypanosoma, anti-Leishmania and cytotoxic activities of natural products from Psidium brownianum Mart. ex DC and Psidium guajava var. Pomifera analysed by LC-MS. Acta Trop. 2017;176:380-4. Machado AJT, Santos ATL, Martins GMAB, et al. Antiparasitic effect of the Psidium guajava L. (guava) and Psidium brownianum MART.EX DC. (araçá-de-veado) extracts. Food Chem Toxicol. 2018;119:275-80. Younus I, Alkathiri B, El-Khadragy MF, et al. Pomegranate (punica granatum) juice shows antioxidant activity against cutaneous leishmaniasis-induced oxidative stress in female balb/c mice. Int J Environ Res Public Health. 2017;14(12):1592. Younus I, Siddiq A. In-vitro antileishmanial activity of raphanus sativus l. var. caudatus. J Basic Appl Sci. 2016;12:242-4. Bernard NJ, Christopher OA, Makwali NJ, et al. Evaluation of leishmanicidal activity and cytotoxicity of Ricinus communis and azadirachta indica extracts from western kenya: in vitro and in vivo assays. BMC Res Notes. 2015;8(1):650. Lezama-Dávila CM, McChesney JD, Bastos JK, et al. A new antileishmanial preparation of combined solamargine and solasonine heals cutaneous leishmaniasis through different immunochemical pathways. Antimicrob Agents Chemother. 2016;60(5):2732-8. Mutoro CN , Kinyua JK , Ng'ang'a JK , et al. In vitro study of the efficacy of Solanum nigrum against Leishmania major changes.F1000 Research. 2018;7:1329. Cos P, Janssens J, Piñón A, et al. Efficacy of four Solanum spp. Extracts in an animal model of cutaneous Leishmaniasis. Medicines (Basal). 2018;5(2):E49. Dasa A, Dasa M, Dasb N et al. Evaluation of the antileishmanial potency, toxicity and phytochemical constituents of methanol bark extract of Sterculia villosa. Pharm Biol. 2017;55(1):998-1009. Lage PD, Andrade PHR, Lopes AS, et al. Strychnos pseudoquina and its purified compounds present an effective in vitro. Antileishmanial activity. Evidence-Based Compl Alter Med. 2013;1-9. Dias CN, Klinger AF, Rodrigues AAF, et al. Molluscicidal and Leishmanicidal activity of the leaf essential oil of Syzygium cumini. skeels from Brazil Chemistry Biodiversity. 2013;10(6):1133-1141. Moulisha B, Ghosh AK, Kanti HP. Anti-leishmanial and anti-cancer activities of a pentacyclic triterpenoid isolated from the leaves of terminalia arjuna combretaceae tropical. J Pharma Res. 2010;9(2):135-40. Sharma P, Rastogi S, Bhatnagar S, et al. Antileishmanial action of Tephrosia purpurea linn, extract and its fractions against experimental visceral leishmaniasis. Drug Devel Res. 2003;60(4):285-93. Martín Z, Gonzalez-Salazar F, Sergio R, et al. In vitro activity of Tridax procumbens against promastigotes of Leishmania Mexicana. J ethnopharmacol. 2009;122(3):463-7. Kaur S, Chauhan K, Heena Sachdeva. Protection against experimental visceral leishmaniasis by immunostimulation with herbal drugs derived from Withania somnifera and Asparagus racemosus. J Med Microbiol. 2014;63:1328-38. Mondal S, Roy P, Das S, et al. In vitro susceptibilities of wild and drug resistant leishmania donovani amastigote stages to andrographolide nanoparticle: Role of vitamin e derivative tpgs for nanoparticle efficacy. PLoS One. 2013;8(12):e81492. Sinha J, Mukhopadhyay S, Das N, et al. Targeting of liposomal andrographolide to l. donovani-infected macrophages in vivo. Drug Deliv. 2000;7:209-13. Roy P, Das S, Bera T, et al. Andrographolide nanoparticles in leishmaniasis: characterization and in vitro evaluations. Int J Nanomedicine. 2010;5:1113-21. Das S, Halder A, Mandal S, et al. Andrographolide engineered gold nanoparticle to overcome drug resistant visceral leishmaniasis. Artif Cells Nanomed Biotechnol. 2018:1-12. Tiwari B, Pahuja R, Kumar P, et al. Nanotized curcumin and miltefosine, a potential combination for treatment of experimental visceral leishmaniasis. Antimicrob Agents Chemother. 2017;61(3):1169-16. Medda S, Mukhopadhyay S, Basu MK. Evaluation of the in-vivo activity and toxicity of amarogentin, an antileishmanial agent, in both liposomal and niosomal forms. J Antimicrob Chemother. 1999; 44(6):791-4. Sousa-batista AJ, Poletto FS, Philipon IMS, et al. Lipid-core nanocapsules increase the oral efficacy of quercetin in cutaneous leishmaniasis. Parasitology. 2017;144(13):1769-74. Chaubey P, Patel RR, Mishra B. Development and optimization of curcumin-loaded mannosylated chitosan nanoparticles using response surface methodology in the treatment of visceral leishmaniasis. Expert Opin Drug Deliv. 2014;11(8):1163-81. Halder A, Das S, Berab T, et al. Rapid synthesis for monodispersed goldnanoparticles in kaempferol and anti-leishmanial efficacy against wild and drug resistant strains. Royal Society Chem. 2017;7:14159-67. Ali M, Bahreini D, Shokri J, et al. Nanovaccine for leishmaniasis: preparation of chitosan nanoparticles containing Leishmania superoxide dismutase and evaluation of its immunogenicity in BALB/c mice. Int J Nanomedicine. 2011;6:835-42. Fonseca-Silva F, Inacio JDF, Canto-Cavalheiro MM, et al. Oral efficacy of apigenin against cutaneous leishmaniasis: involvement of reactive oxygen species and autophagy as a mechanism of maction. PLoS Negl Trop Dis. 2016;10(2):e0004442. Mandlik V, Patil S, Bopanna R, et al. Biological activity of coumarin derivatives as anti-leishmanial Agents. PLoS One. 2016;11(10):e0164585. Manjolin LC, Goncalves MB, Maquiaveli CC, et al. Dietary flavonoids fisetin, luteolin and their derived compounds inhibit arginase, a central enzyme in Leishmania (Leishmania) amazonensis infection. Food Chem. 2013;141:2253-62. Silva ER, Maquiaveli CC, Magalhães PP. The leishmanicidal flavonols quercetin and quercitrin target Leishmania (Leishmania) amazonensis arginase. Exp Parasitol. 2012;130:183-8. Olías-Molero AI, Jiménez-Antón MD, Biedermann ID , et al. In-vitro activity of silybin and related flavonolignans against Leishmania infantum and L. donovani. Molecules. 2018;23(7):e1560. Kayser O, Abreu PM. Antileishmania and immunostimulating activities of two dimeric proanthocyanidins from khaya senegalensis. Pharm Bio. 2001;39(4):284-8. Jerónimo LU, Spina R, Casasco A, et al. Germacranolide-type sesquiterpene lactones from Smallanthus sonchifolius with promising activity against Leishmania mexicana and Trypanosoma cruzi. Para Vect. 2017;10:567. Barrera P, Valeria P, Lozano E, et al. Natural sesquiterpene lactones induce oxidative stress in Leishmania Mexicana. Evidence-Based Compl Alter Med. 2013;16(4):1-6. Freddy A, Coy-Barrera E. In-Silico analyses of sesquiterpene-related compounds on selected Leishmania. enzyme-based targets.Molecules. 2014;19(5):5550-69. Amoa-Bosompem M, Ohashi M, Mba-Tihssommah M, et al. In vitro anti-Leishmania activity of tetracyclic iridoids from Morinda lucida, benth. Trop Med Health. 2016;44:25. Thiago RM , Costa-Silva TA, Tempone AG, et al. Antiparasitic activity of natural and semi-synthetictirucallane triterpenoids from schinus terebinthifolius (anacardiaceae):structure/activity relationships. Molecules. 2014;19:5761-76. Roy S, Dutta D, Eswara M, et al. Mahanine exerts in vitro and in vivo antileishmanial activity bymodulation of redox homeostasis. Sci Rep. 2017;7:4141.